Pellaea rotundifolia is the New Zealand Button Fern and is an excellent low growing fern for a shaded position, or for growing indoors. 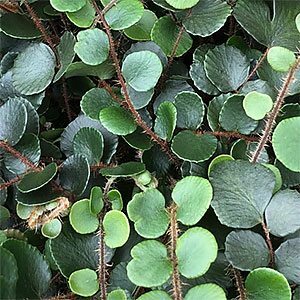 Used both in the garden as ground cover as well as being grown in pots or hanging baskets where it’s trailing nature is shown off the ‘button fern’ is easy to grow and requires little care. This is a native of New Zealand, and this is a fern with small green rounded pinnae (leaflets), like little buttons along the stems. The stems grow in an arching habit and is suited fairly dry soil conditions. Although it is fairly low growing it can reach a height of 30 cm, it is easy to prune and it left, the longer stems will begin to droop back down. Best grown semi shade, a position where it gets some morning sun is ideal. Pellaea rotundifolia is a clumping fern and propagation can be by division of established clump, which can easily be divided in early spring as is required. A humus rich moist but well drained soil is best. When planting dig in a little well rotted compost and water in with a liquid seaweed fertiliser for great results. Little care is requires other than an annual ‘tidy up’ of any dead or damaged foliage. Plants can be pruned back to maintain shape as is requires. A little top dressing every year or two with aged cow manure seems to do wonders, and a little liquid seaweed fertilizer keeps it going nicely. Usually propagation is by division, carried out in spring. It is is simply a matter of using a sharp spade, knife or saw to cut the plant into sections always retaining a good root system on each section. Repot and water in with a liquid seaweed fertiliser. Common Name – Button Fern. Height – To around 30cms. Spread To around .5 metres. Position – Part sun to afternoon shade. Foliage – Deep green and rounded.